What is the load capacity of a mobietec roof rack? The load capacity of the roof rack always exceeds the load capacity of the roof of the vehicle. One cross beam of the roof rack can, depending on the model, take a load of 200 to 300 kg. The maximum roof load, specified by the manufacturer of the vehicle, is therefore always decisive. Due to the low weight of a mobietec roof rack, however, there is a greater weight that can still be charged before the maximum roof load prescribed by the manufacturer of the vehicle is exceeded. The weight that can still be loaded is indicated on the product by means of a gray sticker that is visibly applied. In addition to all this, it is very important that the user always reads the user manual, which is added to each product and is marked with a yellow info-sticker. 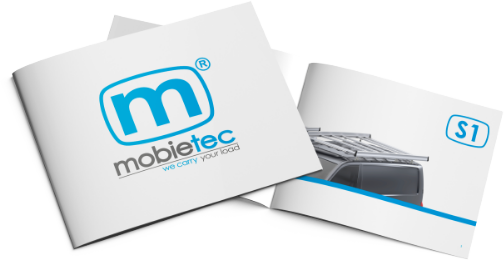 The supplier of your mobietec product is responsible for handing you the user manual as it is an integral part of the product. I noticed there are different roof rack versions available. What dimensions are used and where can i find them? We have indeed different versions available. A technical sketch can be found under the details of the product on the product page. Can mobietec products be mounted in combination with products from other brands? Certainly. We are always looking for a good solution. If necessary or where possible, adaptation pieces are made, so that we can assemble our product with respect for the products of other brands. Why do mobietec product have several inspection and test certificates? Although everything is thoroughly tested indoors, these are not official tests. As there are specific guidelines for the products to test, mobietec has partnered with estl to test all products by third parties and according to specific guidelines. This way we could determine how heavily our products can be taxed. This way we can offer our products with peace of mind. It is also the way for mobietec to demonstrate and guarantee the quality of the product. What data does mobietec need from me to enable me to place an order? We need the right brand and type of the vehicle. When in doubt about the version of the car, it is certainly useful to give us the wheelbase, total length and height of the vehicle. For some cars, the customer can order a preparation for fitting a roof rack in the garage. This information is necessary for us to provide the correct anchorages. Furthermore, an inner lining on the roof, side walls or rear doors can affect the assembly time and this information is therefore necessary to estimate the assembly time and any extra requirements. In addition, it is useful to know if there is a ladder on the rear door or on hinges present, or whether the vehicle has rear windows or hinges that allow the doors to open 270 °. Before we install a glass rack, it is important to know whether there is already a roof rack (brand) installed (or if there are plans to install one in the future) or if no roof rack is required. All products are developed and produced by mobietec. The employees of mobietec make all products by hand, according to the specifications of the customer. How can I order mobietec products? mobietec works with a network of garages and converters who offer our products. Outside Belgium we work with distributors who distribute our product through their channels across the country. On this website you can always request a quotation our find the nearest distributor. How do deliveries take place and what is the delivery term? A mobietec product is delivered ready for assembly. This usually happens with external transport. Because we work with a regular carrier for every country, we can count on a good service. After we receive an order, it is scheduled for production and an order confirmation with delivery date is sent to the customer. The delivery of the product depends on the destination. But normally the product leaves the factory between 5 to 7 working days after order confirmation. For special orders or quantities, a delivery date is set in consultation with the customer. Can I turn to mmobietec for customization? Of course! Usually we deliver tailor-made solutions without needing extra production time. A roof rack that, for example, needs to be slightly longer or wider for the customer, does not require extra production time for us. More significant changes, which require more consultation between the customer and us, may require a little more time. Here too, the healthy principle applies to verify the delivery time when ordering. What is normally included in mobietec products? Generally, a spoiler is mounted on the roof rack when necessary. Each roof rack for a car with rear doors comes with a ladder roll (not included for cars with tailgate as the space where the ladder roll normally sits is needed to open the valve). Each glass rack comes with 2 load-securing poles and with necessary legal equipment, according to the country where the product is delivered. The internal glass rack comes as a basic frame. Different accessories are available: load-securing poles, folding supports, fasteners for load-securing poles etc. Every product comes with the necessary mounting accessories (fasteners) as well as with a mounting and operating manual. Didn't find where you looking for?